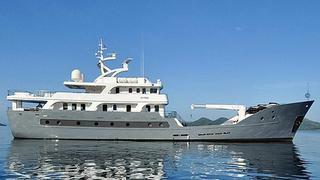 Simon Turner at Northrop & Johnson in Singapore sends word of a $500,000 price cut on the 42m ice-classed expedition yacht Anda. Built as a Norwegian ice breaker in 1964, she was converted into a luxury superyacht in 2012 and accommodates 10 guests in five cabins. A powerful Winchmann engine gives her a range of over 6,500 nautical miles. Located in Southeast Asia, the price of Anda is down from $16 million to $15.5 million.